This game is hard! I made it through the first set of branches (where there are 2 levels in parallel), but I’m stuck on all the levels at the point where it branches out to 7.
compsciguy: I don’t know if it will help that much, but consider looking around the internet for information on finite state automata and Turing machines, as lots of these are classic examples. 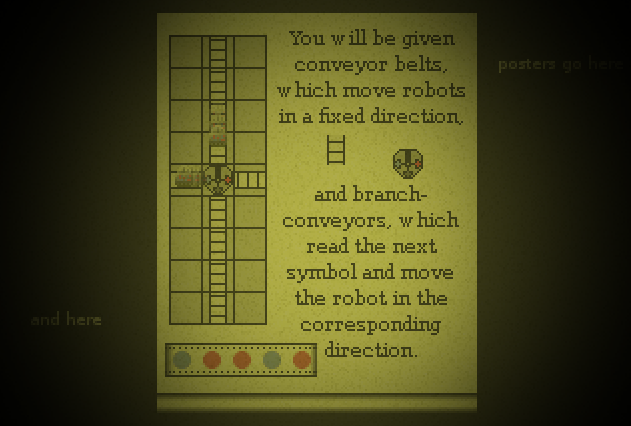 I specifically remember homework questions similar to many of the puzzles in this game from a computational theory course I took in college. Wow! I did not expect to see this here today. Thank you for the glowing praise! P.S. : The model for the game is actually a somewhat obscure FSM called a queue machine. It has the advantage over a Turing Machine of only having two operations (push/pull, as opposed to read/write/move), while still being Turing-equivalent! Very early versions of the game used a two-stack PDA, but that was pretty much horrendous. P.P.S. : In my defense, I did not actually know you had a game named Manufactoid when I named Manufactoria. I was rather embarrassed when I came back here to get links for Proper Attribution – but by then, it was too late!